Research scientist Janelle Shane came up with a novel way to woo your tech-savvy partner this Valentine’s Day. 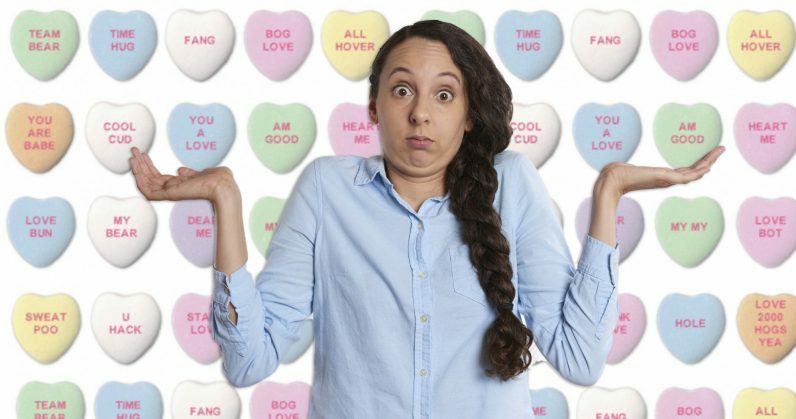 Shane collected all the phrases from the popular Valentine’s heart candy — the one with messages like “Love You” or “Be Mine” — and fed them into a machine learning algorithm. The algorithm strips the word of meaning — it really only understands characters, not context — and begins to spot patterns in the dataset. After training the neural network, it began coming up with phrases of its own by matching the patterns in the dataset. “Stank Love” replaced the classic “Be Mine,” for example, and I’m still not sure what’s romantic about “Sweat Poo.” Some offer up improvements on the tired originals, like: “My My” and “Love Bot.” Others, like “Fancy My Hero,” and “Pin a Face” are a little odd, but could seep into the vernacular with the right meme — one of the dank variety. If you’re looking to impress your tech-savvy Valentine, look elsewhere. If you’re looking for a laugh, Shane’s experiments in artificial intelligence are just what you need. Check out her blog for more insight into this, and other projects, like: AI pickup lines.